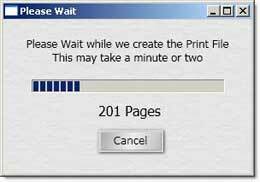 When you hit Create Print File in the Printing tab, a Print File is created and saved, containing all the items to print. Print in batches of pages from this saved file. 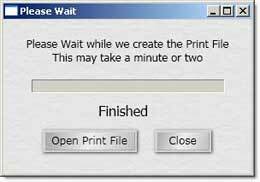 Open the file and select File/Print from the Menu to print. Open this Demo Print File to see the format. Any pages that are not printed correctly (low ink, paper jam?) can easily be re-printed from this file. Set printer margins to 0 (or none) and printed scale to 100%. If your printer still crops the items with these settings (and correct paper size selected), try increasing the margin setting in CardPrinter, and creating a new print file. This will increase the top, right, bottom and left margins, making the printed items slightly smaller. You may need to adjust objects on the designer if the size changes too much. If you can't get your printer to exactly align the printed output on the paper, you can adjust the printed page layout left or right and up or down in the print file itself. Click the MarginX or MarginY labels to enter Horizontal alignment (left - right) or Vertical alignment (up - down) between -30 and +30 pixels. If Entered adjustment is more than Margin (X and Y) the printed area will be on the edge of the page. 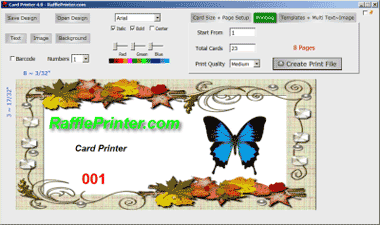 To see how this works, create a quick test print file with MarginX set to 20, and Horizontal Adjustment set to -30. Open the print file to see the printed areas has moved to the left side of the page. 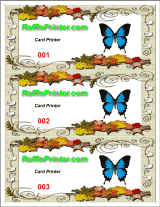 You can also send the Print File to a Printing Company, to have it printed for you.